I believe I found out about this either from Bravewords.com or KISSFAQ.com…..either way, it’s a nice figure but a lot of money. It’s a custom job with great attention to detail but look at the price!. I’ve seen the original Mego KISS dolls go for less. 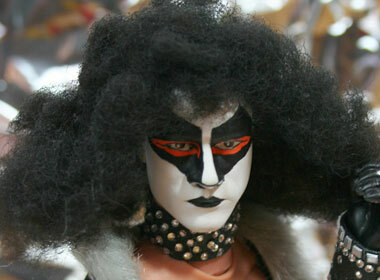 I’ve also seen some very nice custom Eric Carr and Vinnie Vincent dolls at KISS Konventions go for a fraction of this price. I’ll put this under Ebay Madness because the price is definitely madness! 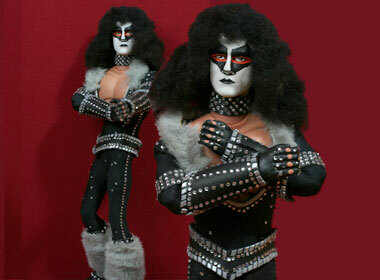 LIMITED TOYS DESIGN is proud to present his first figure based on Eric CARR, KISS’s drummer from 1980 to 1991. We worked on the development of this prototype. Our project will consist in creating this 12” figure as an official limited edition of 150 pieces with a certificate of authenticity numbered. It’s a 12 inch figure, fully articulated (30 points of articulation). 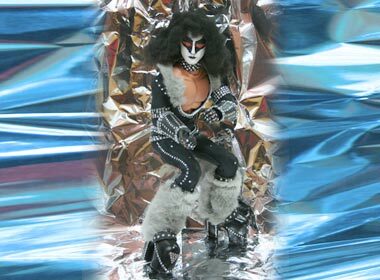 The costume is in real fabric, some fur on the platform boots and the collar, and near 900 strass are need to respect with care the original costume of Eric CARR. The box is covered with imitation leather. We don’t know if a collector like this one will seduce the fans of Eric you are. We are waiting for your feedback. To valid this project, we need your pre-ordering. For the moment, we are just asking you to send us a mail with your complete address and e-mail and telling us you would order this collector figure to order@limitedtoysdesign.com . If the project succeed, we’ll come back to you to ask you 150 US$ to confirm the order. And when your figure will be ready to ship, you’ll pay the rest. This is unique and cool. Ideal collector’s item. Having this popular band member is definitely as point. WHAT’S THE PRICE I WANT ONE NOW!!!!!!!!!!!!!!!!!!! Definitely a collector’s item… Using the 24 inch Spencer limited edition love gun paul stanley doll would make a really cool eric carr collector’s item…I want one how much!! !